"Dance For A Day, Give Hope For A Lifetime"
Greetings from the VUDM 2014-15 Executive Council! In order to further support the families of the Monroe Carell Jr. Children's Hospital at Vanderbilt, we recognize the incredible value in maintaining the relationship between past and present VUDM participants; the work of the past has laid the foundation for how VUDM is presently able to serve the patients and families of Vanderbilt Children's Hospital, and we could not be more thankful for the thousands of dancers and fundraisers who have made the organization what it is today! 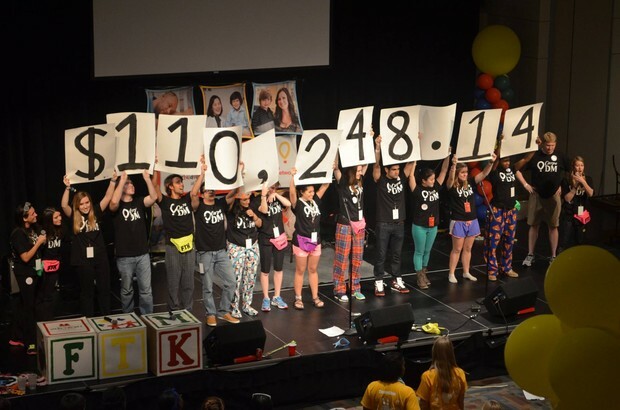 2015 marks the 13th year of Dance Marathon at Vanderbilt University. In its 13-year history, VUDM has remained a mainstay in the vibrant culture of service on Vanderbilt's campus, inspiring students to raise over $1.3 million for the Vanderbilt Children's Hospital. In the words of our friends at University of Florida Dance Marathon, "Dance Marathon is not something you did, its something you do." As a lifetime member of the VUDM Family, your time, effort, and donations are still creating positive changes in the lives of children, each and every day. We ask for your support in continuing VUDM's proud legacy of service at the Children's Hospital. Once a miracle maker, always a miracle maker! VUDM's 2015 donations will be going towards Vanderbilt's "Growing to New Heights" campaign--our dollars will support the final expansion of the Vanderbilt Children's Hospital, an addition of a nearly 160,000 square foot medical tower atop the existing hospital structure. The addition of the new tower will primarily focus on the care of premature infants and other critical care patients. Not only will this new addition enable the hospital to treat the sickest patients that come through the doors each day, but it will greatly increase the hospital's ability to meet the increased demand for care and healing from the Middle Tennessee community and beyond. We ask for your support and donations as we help shape the future of the Vanderbilt Children's Hospital and the lives of the many patients that will benefit from its services in the days, months, and years to come. To learn more about the campaign, click here! To donate online, please follow this link; specify donation to "Vanderbilt University Dance Marathon"